Situated on the southernmost coast of Cyprus, the 6,000-year-old city of Larnaka features a bustling promenade full of bars, cafes, restaurants, and plenty of spots in the sun. Get out of town with these interesting Larnaca side-trips: Aphrodite's Rock (in Kouklia), Stavrovouni Monastery (in Pyrga) and Limassol (Kolossi Castle, Kourion, & more). 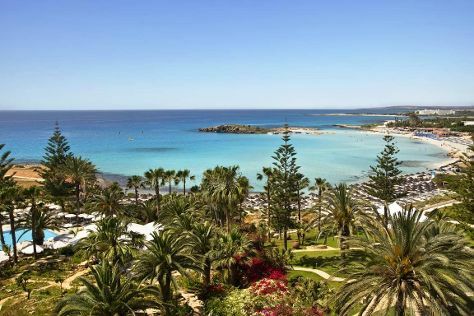 There's lots more to do: kick back and relax at Nissi Beach, stroll through Fig Tree Bay, examine the collection at Panagia (Monastery) of Kykkos, and contemplate the waterfront views at Konnos Bay. To see traveler tips, photos, more things to do, and other tourist information, refer to the Larnaca trip itinerary builder . If you are flying in from India, the closest major airports are Larnaca International Airport, Ercan International Airport and Paphos International Airport. May in Larnaca sees daily highs of 31°C and lows of 19°C at night. Finish up your sightseeing early on the 25th (Sat) so you can travel back home.